Last week I had done my first makeover, but it had been with only moisturizer, foundation, blush, and lipstick. Most of the other girls were more nervous about applying face makeup, but for me it is the other way around. As a past nail-biter, I've always had stumpy and less than ladylike fingernails. On the few occasions I've attempted to paint my own nails, it's always resulted in a paint splattered mess (especially when doing my dominant hand) that I need to immediately clean off. Face makeup can be blended to perfection, but there is no hiding bumps and smears and spills onto skin. Not only that, but the woman is looking down at my work constantly, able to see any slip. Carly, a College Chapter Glammy Award recipient joined us for this makeover and told me that she also had little experience with nail polish prior to GG, as she has always been more of a tomboy. She started by only applying clear polish until her confidence rose with experience and familiarity. It was nice to know others had shared my nervousness but ended up doing so well! After convincing a woman named Frances to join our session, she told us she had small bitten fingernails so she wasn't sure what we could do for her. I was more than happy to moisturize, file, and apply clear polish! My first manicure felt easy and natural, with none of the pressures I had feared. She even posed for a picture to show off her nails! Judith and Mary also joined us again! Mary told us she didn't think we would come back. After talking to other seniors, it turns out Mary only comes to the center on Tuesdays during GG's scheduled time. It's easy to be scared off by Mary's gruffer exterior, but knowing she specifically comes in for us makes talking to her that much more comfortable. Once again she led us in a dance routine. It's so nice to already have regulars; in only two sessions, I feel a real relationship with the Stanley Isaacs Center. 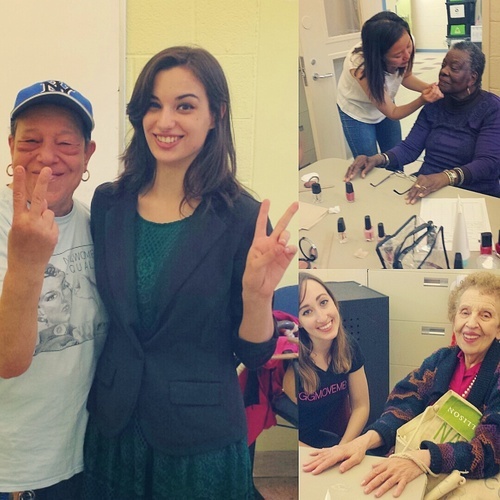 One of the other women told us that what we were doing was really important because many seniors don't get the opportunity or have the resources to be pampered. It reminded me of my own great grandmother in a care facility where most of the seniors have no visitors and there are no activities planned like at the Isaacs Center. This makes me that much more determined to spread the #GGmovement!